In what seemed an unimaginable distance away to a ten-year-old, workers, scientists, military experts, and weaponry wizards were refining the material that could annihilate Russia. The bomb plant was near Aiken—a 61-mile drive from home. Then I discovered the woman next door, Miss Ann, made the 120-plus-mile roundtrip five days a week. A peacekeeper of sorts, she’d gotten on at the bum plant and made things hoboes could only dream about. For a long time I knew little about this nuclear reservation. One July day in 1986 a self-assigned writing project took me to Savannah River Site, the place of childhood hoboes. And what a site! Larger than my home county by 53 square miles, the site sprawled, then as now, over 310 square miles. Its ravenous radiation-fed appetite consumed communities, farmland, graveyards, and a town. The government moved Ellenton lock, stock, and barrel outside the site, a disruptive event like few others. That July afternoon I first saw Ellenton. Brushy undergrowth grew where homes had sat. Where people once slept vines hung from trees. Curbs still looked solid. Not so the cracking sidewalks, which lay beneath a veneer of grass. Many of the younger residents who left never returned. 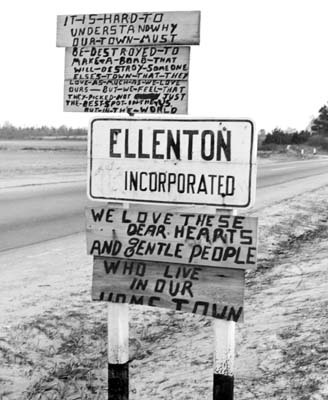 Of those fifty or older who relocated to New Ellenton, over half died within a decade. Expatriates forbidden to visit their old homes, their will to live withered. Neither were the dead spared. One hundred and fifty graveyards were relocated to a real eternal rest. The people from Ellenton who capitulated? In surrendering their town they saved the homes of people across the world, but the radiation? It’s alive and well. People just can’t be at this place anymore. This fact and the need for security keeps the everyday man persona non grata, making the site a natural laboratory, a coup the University of Georgia scored in 1951. Boars, bobcats, perhaps bears, deer, and other wild things dwell in this region of shutdown reactors. The ecology lab’s mission was to study radiation’s effect on plants, animals, and simple-celled organisms. It sounded like a good story to tell. That July afternoon, on a nature quest in the belly of an atomic beast, I began to write. The Ecology Lab’s director, Whit Gibbons, guided me around. He took me to a large creek, a small river in fact that steamed from waters that had just cooled reactors’ cores. I walked onto a steep bank. At its base steam rose over boulders lacquered in orange algae. “Martian,” I thought, “looks just like Mars.” On both sides of this river-creek stood the ghostly tops of dead trees, a scene out of Terminator. I wanted to draw my fingers through that water to gauge its heat. As I squatted to do just that, the pine straw beneath me rolled and I slid feet first toward the water. Whit grabbed me just before my feet plunged into the water. “Man I’m glad you caught me,” I said, much relieved. On one occasion, we drove by massive terraces guarded by razor wire, the burial site for “hot” material with a 100,000-year lifespan. Among the concerns for this radioactive graveyard is the fear language might change so much over 100,000 years people will forget what’s here. And on another assignment I saw a building like few others. “You aren’t allowed to photograph that,” said my guide, a wetlands ecologist. We were driving by a baleful building, R Reactor, the site’s first production reactor. It once manufactured tritium and plutonium-239 isotopes. In 1963, after ten years of operation, a defective fuel rod released Cesium 137 into Par Pond, a man-made lake for cooling reactors. Months later, President Johnson called for a reduction in the arms race. R Reactor closed June 17, 1964. All these years later looking at R Reactor amounts to a Cold War history lesson. For all we know it staved off global calamity. In 2011 the powers that be decommissioned the reactor and filled it with cement, turning it into an impenetrable block. They welded its doors shut. It will stay this way for the next 1,400 years, a nanosecond to the cosmos. Would I go back? Yes. But not to see R Reactor. I’d go to see the nation’s first cloverleaf and Ellenton again. I’d stand inside a home’s foundation and imagine the people who loved this empty space. Perhaps I’d smell biscuits baking, chicken frying, see a TV with rabbit ears facing a plaid sofa, and just out the front window, a Plymouth with fins like a great white. No people. It’s a superb formula. Think how many buildings, parking lots, sewer systems, gas lines, power lines, convenience stores, golf courses, garbage, and dumpsters would afflict these 310 square miles had no SRS existed. But it did, and instead you find solitude. The wind whispers through pines. You hear not one cry from civilization. No contrails, no aircraft mar the blemish-free sky. No litter. No billboards. No mowers. It’s like going back 300 years … the way things used to be. Miss Ann died of cancer. I remember seeing her lying in bed waiting for the end. Maybe radiation killed her. I doubt she realized the majesty surrounding her as she worked away, one of my childhood hoboes. She worked in a wildlife refuge but never spent one night there. I dream of camping in my atomic paradise. I’ll set my camp in a grassy plain beneath stars undiluted by city lights and count shooting stars. I’ll never get to do that though and you’ll never go to SRS without solid justification. As close as you will get is driving through on SC Highway 125 or taking a guided tour. Man’s influence here just isn’t what it once was and that suits me fine. Love your articles Tom! The older I get, the more precious memories of yesterday flood my mind and soul! I only wish I could express them on paper, as you do so eloquently……. Good hearing from you … thanks for the kind words. Finally got to read this. Heart breaking about Ellenton, and so well written. I have since reread “A Sense of the Midlands” and believe your lead story is easily the best piece of all. Don’t stop writing, Tom! I’m a big fan.